Heyo! It’s time for some delightful treats online shopping. Nowadays I shop online not just for fashion, beauty products and travel packages but I also shop for Christmas delights, groceries, gifts and also food. These few days I have relatives from abroad came to Malaysia to visit us. Whenever I have guests at home I will usually stock up my fridge and kitchen cabinet. And I am glad that few weeks ago I ordered some biscuits, cookies, cheese, drinks and food from The Big Box Asia. So over the weekend, we decided to unbox the Delacre biscuits delights and had tea at home. Well, sometimes we crave for Dutch cheese, cookies and biscuits from Europe, Belgian chocolate waffles and etc. So you must get to know The Big Box Asia or also known as TheBigBox.Asia, it is an online plaza of imported and delightful treats at a very reasonable price and attractive package compared to those supermarkets that also have imported treats, delights and groceries that cater for the expatriates and sells at a higher price. So what to expect at The Big Box Asia, let’s start browsing… here they have confectionery like biscuits, cookies, waffles, wafers, beverage like juices, dairy desserts like ice cream and yoghurt, dairy products such as cheese and butter and other seasonal or festive packages. The Big Box Asia is a very user friendly online shopping website, all you need to do is sign up and login, choose the product that you want and if you have any discount voucher or code key in before you check out. Make sure your order and your mailing address including your contact number are correct and then make payment. Confirmed and decide on the mode of payment. You can either choose cash-on-delivery, credit card, debit card, online banking fund transfers. It’s simple as that. My family and I like Delacre biscuits, so when I saw they have it straight away I ordered 3 largest size of Delacre Tea Time Box, 500g and now is on promotion with 42% off at RM25.30. I also crave for the Eru Soft Cheese Spread with Pepper and also Borggreve Almond Cookies. When I received my box I was surprise that I got UmBongo Ananas (Pineapple) 200ml x 3 pieces fruits juice from Portugal for free and also the a RM10 off for my next purchase. I ordered the cheese and when the products arrived it’s still fresh and chilled. This is my first time order chilled product therefore I only order 1 piece to test. If it’s arrived in good condition then the next time I would dare to order more, you know what I mean right. Last weekend when we opened the Delacre biscuits and cookies they are in their original shape not broken or damaged. I am happy with the delivery man because my box is nicely handled no dent or torn. The parcel also arrived 2 days after I ordered, which is acceptable. 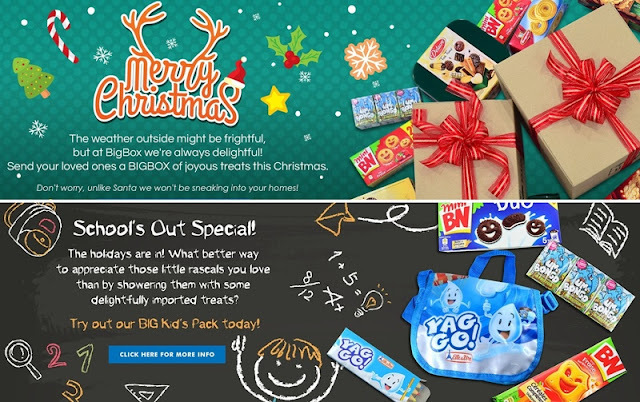 With the festive season and school holiday around, The Big Box Asia also prepared Santa’s Christmas Gift Box and also Big Kid’s Pack promo. You can also arrange to send the Santa’s Christmas Gift Box to your friends’ address to show your love and surprise them. Now I am planning for my next order, I am waiting for The Big Box Asia to restock the Original Belgian Waffles with Dark Chocolate, so this round will be more waffles, cheese and yoghurt because now I know that they deliver the product in good condition. By the way, you might want to know this just in case ya. If you received defective products you can get a free replacement within 5 days from the date when you receive your order with no extra charge. Please take note that they do not accept Returns, Refunds or Replacements after 5 days from when you receive your order. Plus clearance items are not eligible for return. So you can start to browse the website and order the delights that you want or have been craving for so long. Remember to redeem your RM20 coupon and also free delivery when you purchase RM100 and above. Sit back, relax, wait for your parcel to arrive and enjoy the treats with your family, friends or you can even order or for your office pantry or party. Have fun and enjoy your treats. oh Kelly! that look like a delicious goodies for christmas and new year celebration. Merry Christmas and Happy New Year to you ! Sounds like it's a great snack to try it out!~ So nice! looks like they have tonnes of unique snacks around :D just perfect for this festive season! Snacks! I love snacks! I think its time to restock some snacks in my house. thanks for the recommendation! another new player to the market? thanks for sharing! let's start ordering today!